If you’re planning to visit Greece this summer but feel like exploring an off-the-beaten-track destination, how about Sikinos? Known as “the small lady of the Cyclades”, this miniature island is an unmapped heaven, ideal for those you want to hike their way through the numerous beauties of the cycladic scenery and appreciate the raw allure of originality. Sikinos has only three settlements; Alopronoia is the port, while Kastro and Chorio constitute the island’s capital. Alopronoia is a small picturesque harbor that has all the needed facilities, like taverns, markets and rooms to let. 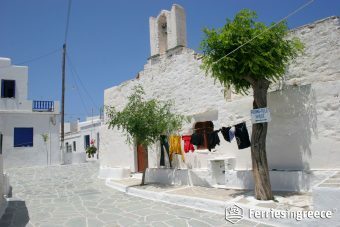 Head up towards Chorio, which will enchant you with its traditional architecture and narrow backstreets. Kastro, the center of activity, is the old fortified capital dating back to the 15th century; built upon a privileged position, it offers a breath-taking view to the Aegean Sea. Stroll through the streets and admire the old houses or stop by the main square for a greek coffee or a shot of raki and meze. 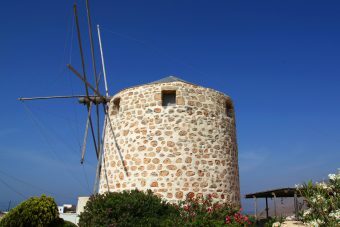 Do not also miss a visit to the Byzantine museum, as well as the Pigi Monastery on the outskirts of the village -and make sure you take a photograph of the spectacular view at the spot of the three windmills! Sikinos retains its rumor as an “untouched” island; few beaches are approachable by means of transport while others can only be reached by feet or small ferries that depart frequently from Alopronoia. Because of its size, Sikinos does not have a great variety of beaches; still you will find crystal-clear waters and picturesque shores. You can go by car to the beaches of Livadi, Agios Georgios and Dialiskari while for Karas, Maltas and Santorineika you can follow the pathways or take a small boat. Make the extra effort to visit “Mavri Spilia” (the black cave), one of the most spectacular caves of the Cyclades -only reachable by boat. The peacefulness of the natural environment will relax you completely and it will be the ultimate detox from the crowded and organized plazas frequently encountered in other Cyclades. Sikinos is an ideal destination for the lovers of hiking and there are numerous pathways that will take you through the hidden beauties of the mainland. The most prefered ones are the path that links Alopronoia to Kastro, as well as the one that starts from Kastro and takes you to Profitis Ilias. Hungry after all these walks? The restaurants in Alopronoia and Kastro serve fresh fish and seafood, while you must definitely try the oven roasted stuffed lamb, the traditional caper salad as well as “ampelofasoula”, a bean variety of great taste. The local dairy products alongside the olive oil and honey are of supreme quality, but the ultimate winner is wine; Sikinos produces wine of amazing taste, known since antiquity. The winery of Manalis worths the visit, as you will not only partake to amazing wine-tasting events but also enjoy your dessert or dinner with a spectacular view to the endless blue.